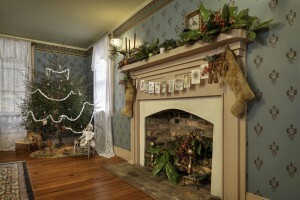 “A Visit from Saint Nicholas (‘Twas the Night Before Christmas)” A public reading in the parlor room of the Chester Inn Museum, featuring Victorian Christmas decorations and a holiday-themed exhibit on toys and games! Readings at 11:30 and 1:30! Join Joe Spiker at the Chester Inn Museum for a special rendition of “A Visit from St. Nicholas.” Commonly known as “Twas The Night Before Christmas”, this poem has been part of the Holiday for over a century. When heard in the magnificent Victorian Parlor of the Chester Inn , read by a gentleman in his Victorian finest, the magic of the season is sure to shine through. Free and open to all ages!